66413 at Maritime, 5th August. Now stored 70015 in right background. Image by Ian Knight. 66413 on 4M67 14:17 Maritime - Hams Hall, at Test Lane, 7th August. Image by Ian Knight. 70015 - last ran on 4th one two three, then designated for dead in tow to Leeds (seen at Maritime with number obscured in upper right of picture at top of this update). 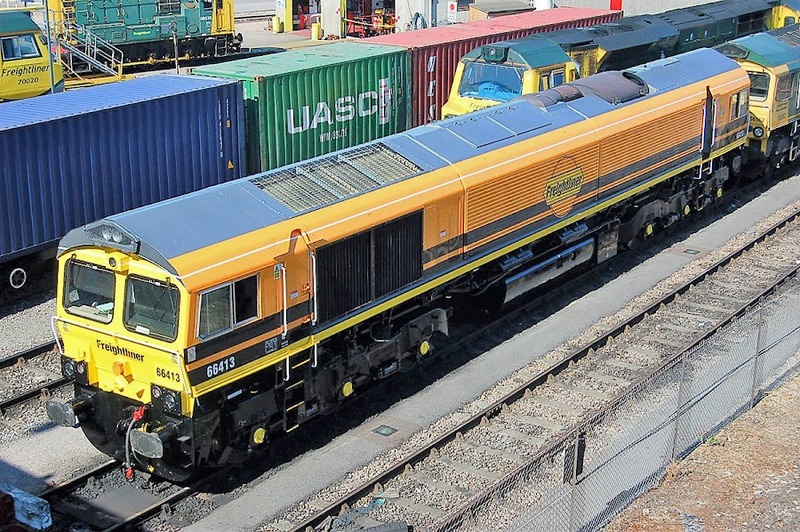 Potential new timber freight flow to Totton Yard: a run was planned for Wednesday 15th: from Chirk (14:05 at Totton) - Thursday 16th: to Chirk (15:17 from Totton). Although not expected next week, if and when this operates, it is anticipated to be Colas Rail. There were three management-pose types in orange waistcoat hi-viz in Totton Yard on Thursday, so something is happening there. These pink ONE containers (Ocean Network Express) - suddenly seem to be everywhere, and in the picture above. "Ocean Network Express was established on July 7, 2017 by the integration of 'K' Line, MOL and NYK". The colour is actually 'cherry blossom magenta'.